“Game of Thrones” Season 7 has gone hard on action through its first five episodes, and Season 6 doesn’t slow down. The penultimate episode of the season, “Death is the Enemy,” spends most of its time following Jon Snow (Kit Harington) and some of the best warriors in Westeros as they strike out beyond the Wall to capture a member of the army of the dead. Episode 5, “Eastwatch,” ended just as Jon had put together his Magnificent Seven for what will probably be a suicide mission — a “suicide squad,” if you will. Episode 6 picks up right the group departs, as they hike north in hopes of capturing an undead wight and dragging it back south to prove the threat of the Night King to Daenerys (Emilia Clarke) and Cersei (Lena Headey). Gendry, who lived most of his life in a blacksmith’s hut, is definitely a little terrified. After Gendry floats away, Tormund has a chance to talk with Jon alone, and gets an update on where the King in the North’s alliance with the Dragon Queen stands. Jon explains that Daenerys will back him against the Night King, but only if he bends the knee. Tormund notes that having spent so much time with the freefolk, Jon has a hard time kneeling for anybody anymore — but he also reminds Jon that Mance Rayder (Ciarán Hinds), the King Beyond the Wall, also refused to kneel. And Mance’s pride wound up getting a whole lot of freefolk killed when he attacked the wall and later when he refused to pledge fealty to Stannis Baratheon (Stephen Dillane). Jon seems to take the wisdom to heart. A little way back on the trail, Gendry meets up with Beric Dondarrion (Richard Dormer) and the red priest, Thoros of Myr (Paul Kaye). The last time Gendry saw the two men from the Brotherhood Without Banners, they sold him to the Red Woman, Melisandre (Carice van Houten). And then Melisandre tried to sacrifice Gendry in a blood ritual. While Gendry is getting mocked for being rightly mad at people who literally sold him, Jon spends a few minutes with Jorah Mormont (Iain Glen), talking about Jorah’s father, Night’s Watch Lord Commander Jeor Mormont (James Cosmo). Jon finally offers Jorah Longclaw, the Valyrian steel sword Lord Commander Mormont gave Jon. Jorah turns the sword down because of his past indiscretions, though. “May it serve you well, and your children after you,” Jorah tells Jon. After all those heart-to-heart moments, we head down to Winterfell, for another discussion about good people who are now dead. Standing on one of the walkways over the central yard, Arya Stark (Maisie Williams) tells Sansa (Sophie Turner) about a day when she swiped a bow and used it to practice shooting, something against the rules for a girl. When she finally hit the target, she realized Ned Stark (Sean Bean) had been watching, and approved. But Arya uses the nice memory of a formative moment in her youth to transition into accusing Sansa of helping the Lannisters execute Ned. Arya’s got the letter she discovered in the chamber of Littlefinger (Aidan Gillen) that Sansa wrote back in Season 1 to Robb Stark (Richard Madden). The Lannisters had forced Sansa to write the message, which begged Robb to come to King’s Landing and bend the knee to Joffrey (Jack Gleeson) in order to guarantee Ned would receive mercy. Of course, the Lannisters still murdered Ned anyway. Arya doesn’t accept any of Sansa’s excuses, and rightfully intuits that Sansa is worried about the letter because if the northern lords know about it, they’ll lose respect for Sansa and might not support her. “What will little Lyanna Mormont say,” Arya asks. 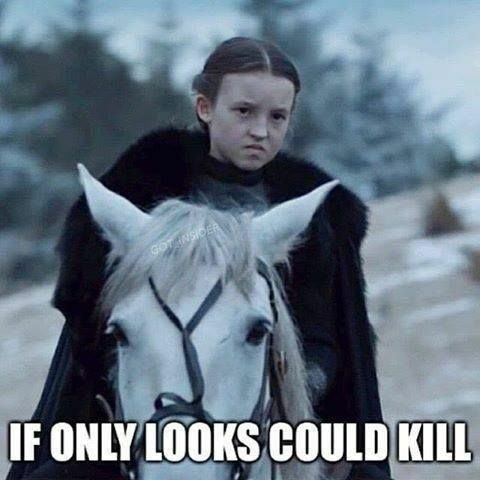 “She’s younger than you were when you wrote this.” And nobody wants Lyanna Mormont mad at them. Just that face is enough to devastate people. Arya’s been paying attention, and knows some of the lords favor Sansa as their ruler over Jon Snow, who has been hanging out on Dragonstone and is now north of the Wall. Arya thinks Sansa is making a power play with Littlefinger’s backing, and while Sansa doesn’t seem like she plans to betray Jon, she does seem like she’s enjoying the power of being the Lady of Winterfell. After all that tension, “Game of Thrones” does the audience a solid and heads back north of the Wall, where the characters generally aren’t considering whether they should kill each other. Tormund goes to talk to the Hound, bringing up the “beauty” who is “waiting” for him back at Winterfell. As Tormund starts describing her, the Hound figures out who he’s talking about: Brienne of Tarth (Gwendoline Christie). He disbelievingly asks if Tormund is “with” Brienne. “The way she looks at you — like she wants to carve you up and eat your liver?” The Hound asks. “You do know her,” Tormund answers. Elsewhere, we get the conversation that gives Episode 6 its name. Beric catches up to Jon to talk about Ned Stark, who he notes Jon doesn’t look much like (meanwhile, we in the audience know exactly why that is). But what Beric really wants to talk about is the fact that both he and Jon have been resurrected from the dead. Beric explains that he’s not fighting for some random lord to hold the throne. He’s fighting for life. “Death is the enemy,” he tells Jon. “The first enemy and the last.” Jon realizes it’s the same idea he served as a member of the Night’s Watch — trying to protect the realms of men. A moment later, the Hound spots the mountain he saw in his vision in the fire. Things are about to go down. But not yet. Also Read: “Game of Thrones”: What Exactly Did The Hound See in the Flames? First, it’s a quick drop by Dragonstone, where Daenerys and her Hand of the Queen, Tyrion Lannister (Peter Dinklage), are hanging out talking about ruling stuff. It’s clear Daenerys still is a little wary of Tyrion and his family loyalties when they start to discuss the upcoming meeting with the Lannisters in King’s Landing. Before long, the discussion turns hostile. Daenerys isn’t happy about how the war is going or that she keeps being held back from defeating her enemies. Tyrion brings up the Tarlys, who Daenerys executed with dragonfire in the last episode, and how keeping them alive could have been more useful, as well as better public relations. But when Tyrion transitions to discussing the future and who will rule after Daenerys, since she can’t have children. When Tyrion says he’s serving her by planning for the long term, she shuts him down. Back beyond the Wall, it’s cold, dark, and windy when the expedition spots a bear in the blizzardy distance. Gendry asks, “Do bears have blue eyes?” and we suddenly know it’s finally time to fight some zombie creatures. The giant undead bear is tough to spot in the storm and does some serious damage to a couple of the nameless freefolk the more important characters dragged beyond the Wall with them to get killed in battles like this one. Beric and Thoros try to use their flaming swords to defeat the bear, and Thoros saves the Hound by shoving him out of the way at a key moment — but the bear tears into Thoros’ chest for his trouble. The Hound, paralyzed by his fear of fire, can’t bring himself to help. Jorah finally takes down the bear by stabbing it with his dragonglass daggers. That’s a bit of a rule change for defeating the undead, since previously we only knew that dragonglass was useful in defeating White Walkers. It seems the blades are also effective against the wights, bringing the bear down immediately. Thoros is hurt pretty bad, and Jorah suggests they should take him back to Eastwatch. But without a wight, the mission would be a failure, and Thoros refuses to go back. 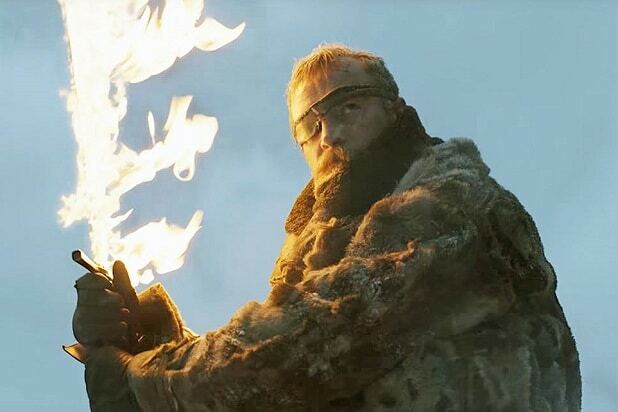 Beric cauterizes the wound with his fiery sword instead. Back at Winterfell, Sansa meets with Littlefinger to discuss her fears about Arya. She starts by asking how Arya came by the message Sansa wrote to Robb, and Littlefinger says he doesn’t know — but we know that’s a lie, because Littlefinger watched Arya leave his room with the note. In fact, it seems like he planned for Arya to find it. Littlefinger suggests Sansa has been a solid ruler in Jon’s absence and that many of the northern lords even prefer her to the King in the North. But Sansa doesn’t think the support of those lords is worth much, and she’s worried if she loses their loyalty, Jon won’t have an army when he returns. Littlefinger suggests Brienne, who is honor-bound to protect both Stark girls, would have to intervene if one of them tried to harm the other. Sansa agrees, but it’s clear she’s knows she’s considering that Littlefinger is trying to manipulate her. Meanwhile, there’s more hiking to do for the team north of the Wall, and while Thoros was hurt, he’s still trucking. Jorah sticks with him, asking about a bit of history that wasn’t in the show: the siege of Pike, a battle that happened years before the show started during the Greyjoy Rebellion. Jorah and Thoros both fought in that battle — as did Jaime Lannister (Nikolaj Coster-Waldau) — and during it, Thoros famously was the first one to charge through the broken wall of the Iron Island castle of Pike when it was breached. “Just the drunkest,” Thoros replies. Just ahead, Tormund spots a group of the dead, led by a White Walker. Finally, the expedition has found what it’s looking for. They attack, with Jon going after the White Walker and everyone else fighting the wights. Jon manages to kill the White Walker, and all the wights instantly collapse — except one. As the team grabs the last wight and bags it up, it screams, letting the other dead in the area know where they are. Thinking fast, Jon sends Gendry to run back to Eastwatch as fast as he can, to send a raven to Daenerys and let her know what’s happening. Gendry takes off while everyone else flees out of the ravine. The remaining expedition team makes it to a big rock in the middle of a frozen lake, and luckily, the ice breaks beneath the dead army as they chase. The wights can’t cross the lake, but the expedition is trapped. Gendry manages to make it back to Eastwatch, collapsing in the snow as Davos runs out to meet him, but managing to tell them to send a raven. Back on the frozen lake, morning comes, and Beric discovers Thoros died during the night. They use Beric’s flaming sword to burn Thoros’ body, and the fire definitely still bothers the Hound. While they’re basically waiting to freeze to death, Jorah notes the new bit of information about the White Walkers: Almost all the wights instantly died when Jon killed the Walker they were with. Jon figures the wights raised by a particular Walker die when that Walker is killed. Beric suggests if they can kill the Night King, the entire army of the dead would probably be destroyed. Meanwhile, in Winterfell, Sansa has received the message from Cersei about the coming meeting. Sansa asks Brienne to go in her stead and represent her in the meeting. Brienne doesn’t like the idea because she doesn’t want to leave Sansa alone and unguarded. But Sansa insists. With Littlefinger looking to use Brienne against Arya, it seems like Sansa is probably trying to out-think him by removing Brienne from the equation. 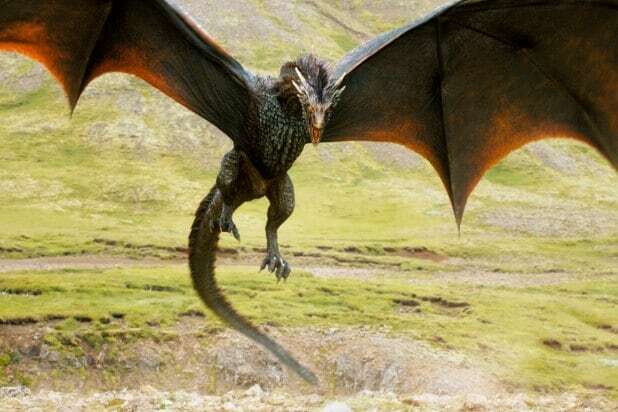 At Dragonstone, Daenerys has received the raven from beyond the Wall and is getting ready to go to Jon’s rescue. Tyrion tries to stop her, but Daenerys says that she listened to Tyrion before when he told her to do nothing, and she won’t do nothing again. She climbs onto Drogon and together with the other two dragons, Viserion and Rhaegal, and flies for the north. Also Read: What is Bran Stark’s Master Plan on “Game of Thrones”? Meanwhile, everyone standing on the rock in the middle of the lake is getting bored. The Hound starts chucking rocks at the dead standing on the edge of the lake, but one falls short, sliding across the ice — and demonstrating that the lake has refrozen. The dead start to rush the rock, and the battle kicks off. Luckily, before anyone other than the nameless freefolk are killed (though there was a very close call with the Hound and Tormund), Daenerys shows up with her dragons. They start ravaging the army of the dead with dragonfire. Drogon lands near the rock and everybody climbs aboard. But Jon hesitates, still slicing through the dead, and it seems like he might be considering using the opportunity afforded by the arriving dragons to try Beric’s suggestion and go after the Night King. Before he can, though, the Night King grabs an ice spear and heaves it at Viserion. The spear slams into the dragon’s chest and sends him crashing into the lake, sinking beneath it. That’s one dragon of three down for the count. Jon tells Daenerys to get out of there before the Night King can kill the other dragons, but as he’s racing back toward Drogon, he’s tackled by two wights and dragged beneath the ice. Daenerys and the dragons escape, but they don’t see Jon pull himself out of the frozen lake. As Jon stumbles off, nearly frozen, the dead start to swarm after him, and it looks like he’ll wind up dying anyway, except much colder than before. But suddenly a rider appears, smashing through the dead and racing toward Jon. It’s undead Uncle Benjen Stark (Joseph Mawle)! Benjen doesn’t hang around for long though. He puts Jon on his horse and sends it running for Eastwatch, holding back the wights while Jon escapes. That seems to be the end of Uncle Benjen once and for all, unfortunately, as he’s overwhelmed by the army of the dead. Back at Eastwatch, everyone’s just about given up on Jon, but Daenerys waits on the Wall, hoping he’ll make it back. Just as she’s about to leave, she Night’s Watch sounds the horn: one blast, ranger approaching. It’s Jon, and though he’s half-frozen, he’s not dead, much to everyone’s surprise and excitement. Meanwhile, Sansa sneaks into Arya’s room in Winterfell, hoping to find the message she sent Robb and steal it back. Instead, she discovers Arya’s satchel of faces, and that’s when Arya discovers her. Arya makes Sansa play the Game of Faces, the game she played with Jaqen H’ghar (Tom Wlaschiha) in the House of Black and White. The idea is that you answer questions with lies in hopes of fooling the other person. “You want to do the asking?” Arya says when Sansa demands answers about the faces. “Are you sure? The Game of Faces didn’t turn out so well for the last person who asked me questions.” Things definitely did not go well for the Waif (Faye Marsay) back in Braavos. Arya tells Sansa with the faces, she can become someone else. Grabbing the dagger she got from Bran (Isaac Hempstead Wright), Arya moves toward Sansa, saying she could even find out what it would be like to be her sister if she took her face. But while Arya’s threatening, she flips the dagger around and gives it to Sansa before leaving the room. Things are escalating quickly between the Stark kids, and it seems no matter where Sansa goes, she can’t escape the game of thrones. Back on the boat from Eastwatch to King’s Landing, Jon wakes up to find Daenerys sitting with him. Having seen the army of the dead, Daenerys tells Jon she’ll join him in fighting the Night King — and Jon offers to bend the knee, even though he’s lying in bed and can’t really get to his knees. The moment they share looks like it might turn romantic even though Daenerys is grieving her dead dragon kid, but she pulls her hand away from Jon’s at the last second. She doesn’t seem willing to let herself feel that way about Jon, or anyone, when what she needs to do is take the Iron Throne and win the war. The last moments of the episode head back beyond the Wall, where a group of people are pulling huge chains. As the camera pans back, we realize it’s the dead, dragging something out of the lake. It’s the body of Viserion. The Night King strides forward, lays his hand on Viserion’s muzzle, and in the last shot of the episode, the dead dragon opens its glowing blue eye. Despite the mission to capture the wight, the Night King is only getting stronger, and the people south of the Wall are going to have plenty to fear when he and his army finally show up.